This blogger thinks autistic children are put under too much pressure to learn. In particular to learn how to fit in. He she believes in letting children play and learn in their own way. 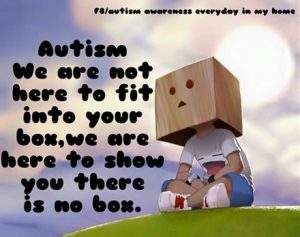 What happens when my autistic child acts differently at Home than he does at School. When the common denominator for the challenging behavior and meltdowns is home, it is all too easy for professionals and schools to jump to the conclusion that “bad parenting” is at work. Instead of blaming parents, schools and professionals should be more understanding of the difference between home and school and more willing to listen when a child is behaving differently outside the school gates. A referral put in from a school may be readily accepted, yet a parent’s request for the same service is often refused. There is still the assumption that if a child truly had challenges, these would manifest in all settings in the same way. An engaging tale and wide ranging critique of the state of play in the story of autism by the novelist David Mitchell. The third item on my wishlist is, too predictably, better funding for education and adult care. 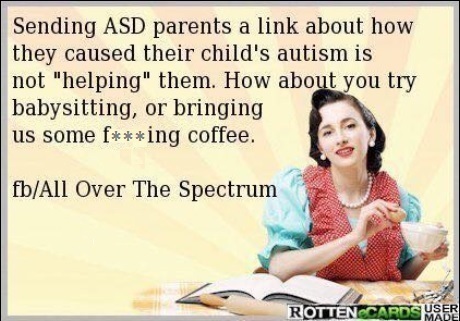 The status quo obliges sleep-deprived autism parents and sympathetic school principals to be frontline activists, just to obtain statutory minimums. This is inhumane and illogical. See TV/Radio updates for a reading of Fall Down Seven Times, Get Up Eight mentioned in the article above. See also Interview of the young Japanese author of the book. Click icon and watch video. The title of the post is, Rubbish ignorant people say to autistics. Entertaining. This article is about the effects of caring for someone with autism. This stress reaction has been named Ongoing Traumatic Relationship Syndrome (OTRS), AKA Cassandra Phenomenon (CP). It is a metaphor for the emotional and physical suffering of spouses and children of adult individuals with AS and high functioning autism, because they are typically disbelieved as they attempt to share the cause of their sufferings with others …–. Click icon on the left for article. Please be aware that it reflects strongly held opinions. For parents of a child towards the lower functioning end of the spectrum see also Challenging behaviour under the heading A mother’s story. It is about a book written with intelligence and insight. This is a story of a mother’s struggle to get appropriate treatment for her daughter. Click PDF icon for full text. I had to practically beg the receptionist to ask the GP to come out to the car as we could not get my daughter out of the car. … I then spent 5 minutes explaining why we would never give medication to her in this way and that in order to give it under a GA we would have to call a best interests meeting.